A new study that links childhood dairy intake with long-term bone health may inspire fathers to add pouring a big glass of milk to their list of parenting skills. Researchers at Boston University School of Medicine looked at the food diaries of more than 100 children between the ages of three and five over a 12-year period. At the end of the study, when the participants were teenagers, they measured the kids’ bone density, bone area and mineral content. 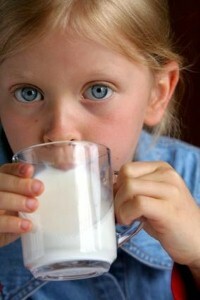 According to the findings, children who had consumed at least two servings of dairy each day when they were small had stronger bones with a higher mineral content. Lead author Lynn Moore said, "Dairy is a key source of proteins, calcium and other micronutrients including phosphorus and vitamin D."
Fathers eager for parenting advice about growth and nutrition may want to make dairy products a regular element of their kids’ diets from a young age. They may also want to encourage their pregnant wife to consume similar foods, as a 2006 Canadian study found a link between infrequent dairy intake and low birth weight.